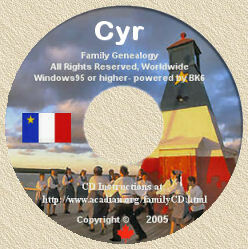 Acadian Genealogy Homepage; Tanguay Dictionaries on CD-ROM. If you are working on Quebec or New France families, Tanguay is a must! The research material on this CD are recorded in French however, translation is simple. The content is primarily alphabetically listed names, dates and events of genealogical interest. Cyprien Tanguay's detailed 7 volumes listing of French-Canadian families, originally published in the 1870's, an essential reference for research in New France and Quebec. Supplement to Tanguay's genealogical dictionary: Two volumes of additions and corrections published in 1957 and 1977. Gleanings from the register: Contains historical information collected by Tanguay, related to families--- but not included in his 7 volume dictionary. Directory of Canadian clergy: An enumeration--- with genealogical details--- of Roman Catholic clergy in New France and Quebec, up to 1880. Cost: $29.99 (US Funds) or $39.99 (Canadian Funds), plus shipping & taxes. For additional information, or to order Online, connect to Global Genealogy & History Shoppe the retail division of Global Genealogy.com Inc., located at 43 Main Street South, Campbellville, Ontario, Canada L0P 1B0 telepphone 905-854-2176 or 1-800-361-5168 (toll-free North America).